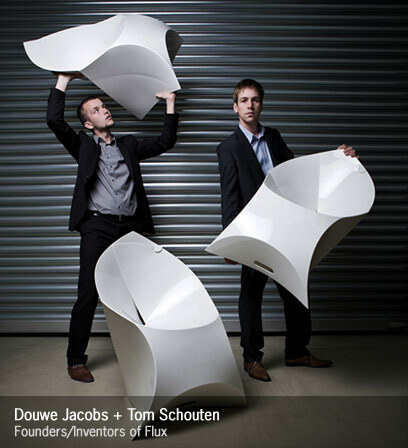 In their 2008 college graduation project, Holland designers Douwe Jacobs and Tom Schouten came up with a concept to create super flat, stylish, foldable furniture. 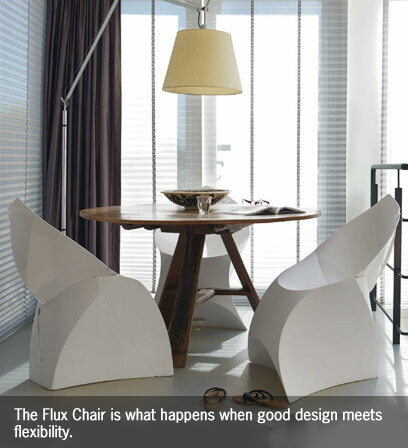 This concept eventually led to their company, Flux, which is fittingly named after transformation, change and "flow." YLiving recently caught up with the young designers, where they gave us a brief history of folding chairs, the production of their Flux Chair, and the ever-important answer to who can fold the chair the fastest. During our studies in Delft we were taught that good design is fundamentally about finding better, more efficient solutions that harmoniously balance form, function and materials in order to enhance life. Our spin on that philosophy is to make our designs look surprisingly simple. We want to make people wonder, "Wow, why haven't I seen this before?" What's the significance of a folding chair in design? As design students we both had a love for furniture and especially foldable furniture. Through research we discovered that during the course of history the folding chair had actually been an object of great stature. Only the last century or so, due to industrialization and the focus on its functional applications, such as use in the army and camping, the folding chair became somewhat of a second rate furniture. Our goal for the Flux Chair was to bring back this status, to create something totally different, and make it universal and simple with a strong visual identity. 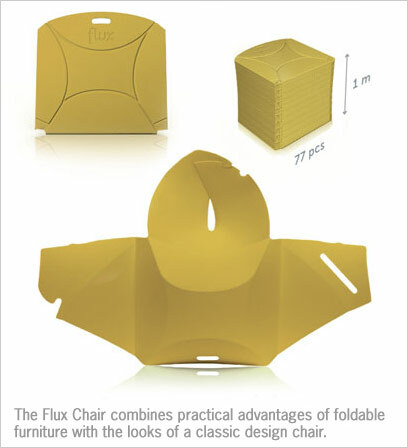 What were the most complicated things you had to solve for in designing the Flux Chair? We gave ourselves some restrictions: we could not add anything to the sheet (e.g. affixing any material) and we could not divide it into several parts. So, it has one sheet with integrated fasteners nd the fasteners were the biggest challenge. The final production chair has a hook that doubles as a fastener for the base (chair state) as well as the envelope (flat state). How many design iterations did you go through before you got the chair to the point it is today? We created several hundreds of scale models and around 100 full scale prototypes, all of them slightly different, to create the perfect shape. What was the biggest obstacle in getting the Flux chair from concept to an actual chair in people's homes/offices/commercial spaces? That was without a doubt the conversion from prototype to production chair. We are currently using a technique called injection molding. This is fairly common, but on our scale and complexity level, something completely new. We knew it was going to be very difficult, but fortunately we had the most experienced injection molders in the country enthused. After the first chairs finally came off the production line, they told us it had been the most challenging project they have ever worked on. How does the material hold up to repeated bending? Extremely well. The more you bend it, the better it will fold. We've tested this in a lab environment by TUV (European testing institution) and tested it in the real world by folding the same chairs thousands of times (we've actually counted this) over the course of a dozen fairs across Europe. 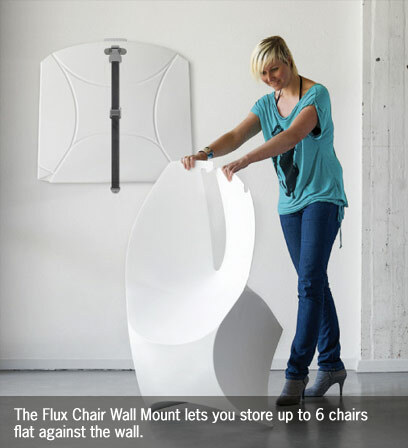 Flux is a very versatile chair. How do you see people using it? In a million different ways. Some people might just set it up once in the living room, and only fold it when they move. Others may use it on a small balcony or in a garden, to fold away in winter. 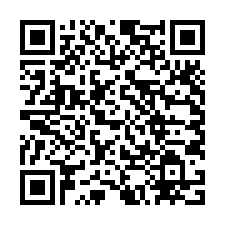 We've also had a lot of applications for events like weddings and fashion shows. It's basically a classy alternative to a conventional folding chair and even more efficient in storage and transport ou can stack over 21 envelopes per feet! If you could have any one person in the world sit in this chair, who would it be? Why? How long does it take you to put the chair together? We actually do folding competitions at all the fairs we participate in. The record is held by Tom who folded it in 2.19 seconds. The first time is a little bit tricky, but after a few times most people can do it in about 5 seconds. A lot! Flux was originally conceived as a line of furniture, so we've had several scale studies of follow up products. We're currently working on 2 very cool new projects that are top secret!